Our award-winning creamy crab creation. Fresh shrimp sauteed with our own special BBQ sauce. Served over creamy grits, topped with cheddar cheese, bacon & green onions. Topped with datil jumpstart sauce, melted cheese, bacon bits & breadcrumbs. Marinated in herb butter and garlic. Covered with melted cheese and topped with seasoned breadcrumbs. Jumbo-sized, hot & spicy or sweet & mild. Served with celery sticks & bleu cheese dressing. Fresh shrimp boiled in spicy seasonings and served cold. Beer battered and fried. Served with marinara sauce. Served with fresh baked garlic breadsticks and choice of two sides. Upgrade one of your side choices to a salad for $1.99. Romaine hearts in homemade Caesar dressing with croutons & Parmesan cheese. Your choice of blackened or grilled chicken or shrimp. Mixed greens, tomatoes & fresh vegetables with a homemade creamy tomato vinaigrette. Your choice of blackened or grilled chicken or shrimp. One inch thick oak plank. Well-seasoned to seal in moist heat. Your choice of fish, chicken, or steak baked in a hot oven. Basted with a mild sherry mustard sauce and topped with crunchy breadcrumbs. 12 ounce choice center-cut ribeye topped with mushroom peppercorn gravy. With green peas and mushrooms in a chipotle pepper cream sauce over penne pasta and topped with Parmesan cheese. In fresh herb and tomato infused olive oil with mushrooms and baby spinach over penne pasta dusted with grated parmesan cheese. Unless indicated * all dinners served with fresh baked garlic breadsticks and choice of two sides. Deep fried to a golden brown. With butter, lemon, and fresh herbs. Rolled in coconut, deep fried, and served with citrus mustard salsa. Puffy and delicious with creamy datil pepper dipping sauce. Filled with Florida blue crab stuffing, basted with herb butter, & baked. Sauteed with "Southern Comfort" barbecue sauce served over creamy grits, topped with cheddar cheese, bacon, & green onions. 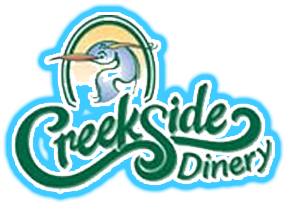 Seasoned with Creekside's spicy datil pepper blend & seared in a hot iron skillet. Sauteed with white wine, garlic, & fresh herbs over capellini pasta. 4 shrimp each, stuffed, fried & grilled. Shrimp, fish, scallops & crab cake. With key lime & tequila butter. Seasoned with Creekside's spicy datil pepper blend then seared in a hot iron skillet. With "Southern Comfort" barbecue sauce served over creamy grits, topped with cheddar cheese, bacon, & green onions. Rolled in cornmeal and dipped in seasoned batter then fried to a golden brown. Lump crabmeat mixed with panko crumbs, Old Bay & fresh herbs served with creamy mustard sauce. Sauteed in butter & seasonings or fried to a golden brown. Battered and fried to a golden brown. Fresh oysters by the bucket. Shrimp, fish, scallops and crab cake. Served with a Zesty Orange sauce. Baked or blackened in our own special BBQ sauce, served over creamy grits, topped with cheddar cheese, bacon and green onions. Pan blackened or grilled over an open flame. Grilled over an open flame. Served with French fries and cole slaw. Choice of two sides available for extra charge. 4 Sarasota Stuffed Shrimp, 4 Fried Shrimp & 4 Grilled Margarita Shrimp. Fried Shrimp, Scallops, Crab Cake & Today's Catch. Pan Broiled Shrimp, Scallops, Crab Cake & Today's Catch. Mixed Grill of Shrimp, Scallops, Crab Cake & Today's Catch. Blackened Shrimp, Scallops, Crab Cake & Today's Catch. Fresh Catch of the Day Baked in our own Homemade BBQ Sauce. Served Over Creamy Grits. Topped with Cheddar Cheese, Bacon and Green Onions.